There’s a saying that you’ve probably heard a million times throughout your life: “you can’t judge a book by its cover.” The wisdom of this old chestnut applies in the case of novels, people, and certainly for games as well. Many times, I’ve picked up a game because the art is appealing, or the bits are impressive, yet the gameplay is lacking. Sometimes, though, what you see on the box lid gives you an exact representation as to the contents, and this is certainly the case for my choice for Game Night Blog Carnival this month. 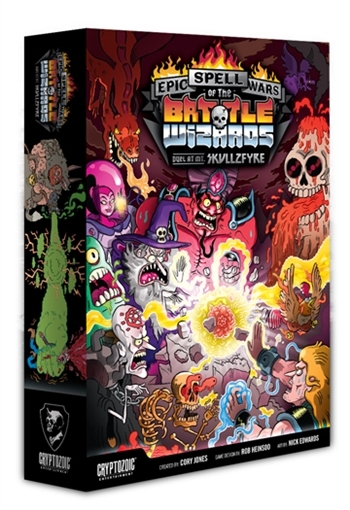 Wrap your head around this title: Epic Spell Wars of the Battle Wizards Duel at Mt. Skullzfire. A lesser game might go for a shorter part of this impressive moniker. Epic Spell Wars alone sounds decent, though a bit generic. Battle Wizards could have been a video game you played on your NES back in the 80s. Duel at Mt. Skullzfire? Now that is quite a bit more interesting, particularly with the leet-speak spelling of the titular mountain. Each piece of the title standing on its own is fair enough, but put all three together, and you have a name that transcends the boundaries of awesomeness. And then there is the art. It is a cross between the Simpsons and something that could have been in the liner notes of your old White Zombie CDs. The art is funny and yet horrific at the same time. You will have a smile on your face, for sure, but might also feel a bit sick to your stomach. Blood and fire are everywhere, as are sliced body parts and a generous helping of innards. The box art alone is intriguing enough, but the depictions on the cards inside are where the unique visual style really shines. The first thing that catches your eye is the cardboard representation of Mt. Skullzfire itself. Composed of two pieces, it assembles easily and stands perhaps six inches tall. I thought at first that such a glorious game piece had to have a tremendous effect in play, but this is not the case. The entire point of this cardboard Mt. Skullzfire is to look awesome. I find this hilarious, and indeed awesome, but some may not. There are several wizard cards in the box, each one depicting one of the Battle Wizards. With full sized art on one side, the only game-related information on the other is an area for hit point tracking. The choice of wizards has no effect on play (yet, though this is an easy area for expansion). Thus, you will be arguing over who gets to be what wizard only on the basis of how cool looking they are. 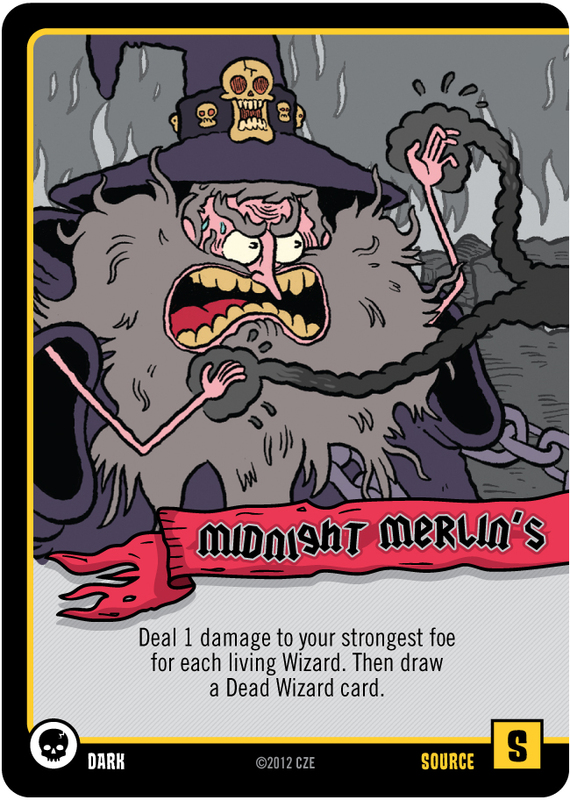 While all Battle Wizards are hilarious, a few favorites of mine include Princess Holiday & Her Furicorn, Fey Ticklebottom the Enchanter, Krazztar the Blood-o-mancer, and Pisster the Pissed Wizard, who is truly a sight to behold. The actual game itself is very simple. Each Battle Wizard is dealt eight cards, most of which represent spell parts. A spell can have up the three parts, including a source (leftmost position), quality (middle), and delivery (rightmost). You can mix and match the different parts of the spell in order to maximize the carnage you wreak on your opponents. 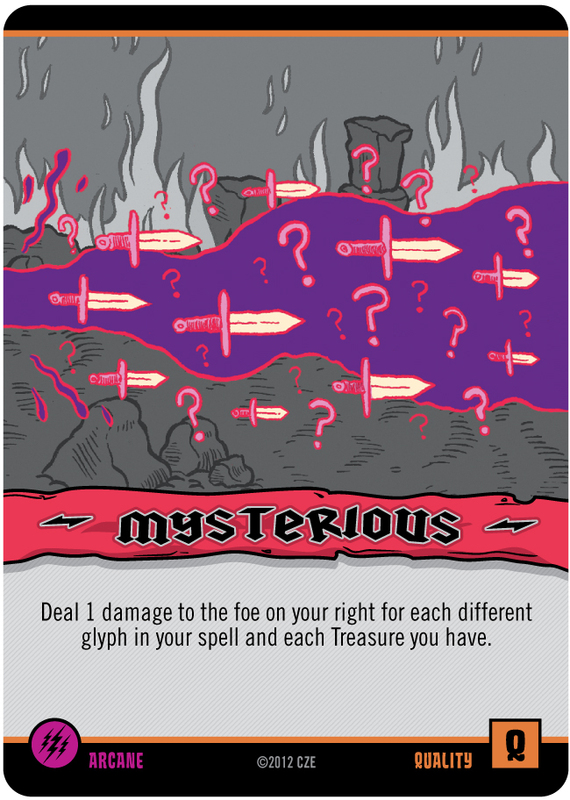 Spells are revealed simultaneously, with initiative determined by number of cards played (fewer parts go off faster) and by a number given on each delivery spell card. Spells all resolve in order, then you draw up to eight cards and do it all again, until there is only one Battle Wizard left standing. There isn’t really a whole lot of strategy or even tactics here. Some spells parts naturally better work with others, but there are no game winning combos to be found. Many spell parts require the use of the included dice for determining effect. Sometimes, you’ll get lucky, sometimes, your spell will backfire on you. If you are one of those people who dislikes randomness and chaos on your table, look elsewhere. 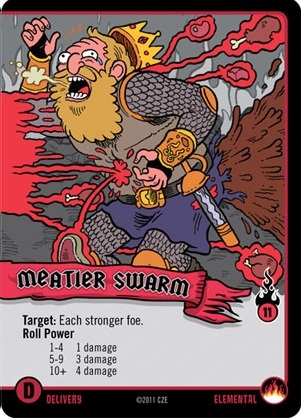 These Epic Spell Wars are not for the highly analytical; they are intended for those who enjoy the unique theme and art style. One caveat, particularly for those with young children who might be interested in playing. There is adult language in the game, though the F-bomb in the manual is far worse than anything in the cards. Some of the more, shall we say, colorful illustrations are definitely PG-13. I am a very conservative fellow, and took out a few of the more extreme cards when playing with my ten year old son. As with most such matters, you’ll need to see the cards and decide for yourself what is appropriate. If you are considering playing Epic Spell Wars of the Battle Wizards Duel at Mt. Skullzfire, ask yourself this question: does casting a spell called Professor Presto’s Ballsy Cone of Acid on your buddy in between taking swigs of soda and dipping chips and salsa sound like a good way to spend some time? If so, you should definitely give the game a try. Just watch out for that Phister Cannon.